This week, Your News to Know rounds up the top news stories involving gold and the overall economy. Stories include: Higher inflation will drive gold’s breakout, gold could get a big boost from geopolitical concerns, and Turkey’s president says international loans should be backed by gold. As gold gears up to break the $1,350 resistance level, analysts at Dutch bank ING see higher inflation as the main driver behind the coming uptrend. Although the Federal Reserve predicts two additional interest rate hikes this year, ING’s commodity strategist Oliver Nugent said in a report that real rates will remain suppressed as the Fed stays behind the inflation curve. The bank’s analysts expect inflation to move closer to 3% over the summer, buoyed by an adjustment in annual comparisons and a weaker dollar. The team also sees geopolitical flare-ups as another potential catalyst behind gold’s much-awaited breakout. Nugent added that the gold market is skewed to the upside, with many investors waiting to move in once the metal reaches $1,350. Besides gold, the team is also bullish on silver, noting that the disproportionate gold/silver ratio makes bearish positions on the latter unsustainable. Because of this, Nugent feels that silver could use the next upturn in the gold market to post gains of its own. According to Todd Colvin, a trader at Ambrosino Brothers, gold’s push past the $1,350 level could come from a variety of directions. 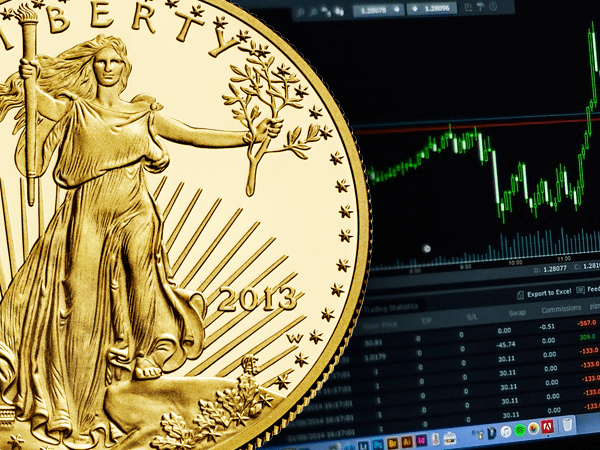 Talking to CNBC, Colvin listed the Fed, the U.S. economy and concerns from abroad as some of the things gold investors should keep an eye on as they prepare for the next upswing. Although earnings are expected to look stable in the next report, Colvin thinks that underwhelming U.S. economic growth could turn out to be a major driver of gold prices. “If you see sub-2 percent GDP, which I think right now isn’t on many radars, that could be a real catalyst,” he said. Likewise, turmoil from different corners of the globe could play an important role in a move above $1,350 an ounce. The metal jumped to its highest level since August 2016 as tensions between the U.S. and Russia grew over the former’s missile strike on Syria. The threat of a trade war with China remains a persistent cause of concern as well, and Colvin believes these issues could bring gold prices to $1,400 in short order. The trader is also optimistic in case of a dip, as he thinks investors would waste no time stocking up on the metal amid lower prices. “If we get that close to $1,330, I think you’re going to see plenty of those speculators come back with both hands to buy it,” he said. Besides Turkey’s entrepreneurial ventures, gold was another highlight of Recep Tayyip Erdoğan’s speech at the Global Entrepreneurship Congress in Istanbul. There, Turkey’s president spared no words in describing how a gold-backed system of international loans could benefit everyone. To Erdoğan, the current dollar-based loan system places undue pressure on countries that are borrowing money, especially those that fall in the category of emerging markets. A shift to gold loans could reduce economic stress and improve the ability of nations to pay back their debt. During the summit’s opening ceremony on April 16, the president revealed that he first voiced his idea during a G20 meeting, where he openly questioned the current method of universal dollar loans. “With the dollar the world is always under exchange rate pressure. We should save states and nations from this exchange rate pressure. Gold has never been a tool of oppression throughout history,” he said.